I found that 'lost' writing time: I spent the early part of my career as a writer, then moved further up the management chain, thinking, "Someday, I'll do more writing again." Five years into blogging, I'm writing enough that I'm now pulling books out of the blogs. Blogs are a facile writing tool precisely because they make the rest easy, from storing your notes in draft to making the graphics and extras easy to post. My website got better: I laughed inside the first time I went to a professional networking event and met a reader of my blog...who didn't realize it. Instead, she said, "I love your website because it's so frequently updated!" She didn't have to know it was a blog. Having a blog helps your website stay updated, hit the search engines, and easily incorporate video, audio, pictures and more. As a result, while this blog originally appeared as the "news & info" section of my website, today it is the main page, and my website's no longer a pixelated brochure out of my corporate presence. Readers rock: Building up a readership takes time, and you will do it over and over again as readers come and go. Five years in, I get my best blogging ideas from readers, who send me links, questions, or even specific requests for posts that tackle what they've been wondering about. If content is king, reader ideas are the gold that makes his crown. I'm always looking for ways to reward those readers! Making money from your blog isn't always obvious. Mine primarily comes from referrals: Potential clients are referred to my blog (or to me), research me on the blog, then hire me. Or they refer others to me. And for those who have been clients, the blog's part of my retention strategy: I always want them to find updates they can use here, and when I am able to share their case studies and examples, I do. It's not just marketing, it's content, it's additional material, it's followup, it's sparking ideas at a time when they're needed. Blogs can serve a multitude of business purposes, if you let them. 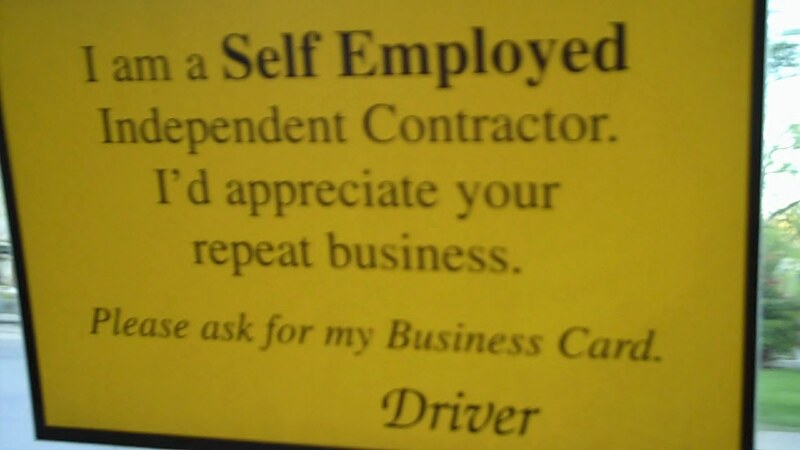 When it comes to content, waste not, want not: I get into a cab in Austin, Texas, and see the sign in the window that you see in the picture above. 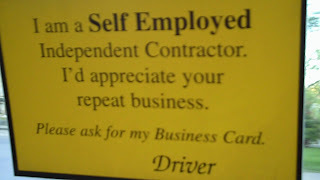 It made me laugh in recognition--the driver and I have the same goals for our different businesses. And so yes, I pulled out my everpresent Flip camera and later pulled a still from that short video, just for the blog. 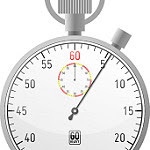 Two minutes, great photo, angle for a post or part of a post. I read widely, ask people for ideas, and make use of every scrap of information that might be useful to readers. As a result, I rarely run out of ideas. Blogging's changed my identity, to some: In journalism, you come up learning the old joke, "Freedom of the press belongs to the guy who owns one" -- and blogging means that anyone can own their own "press" these days. So it's amusing to me, as a former journalist, that some folks now refer to me as a journalist again, or just as a blogger. (I'm really a consultant who blogs, mind you--and if truth be told, I'm also a publisher.) Others see me as an early adopter, which I truly am not, having entered this trend when it was a safe six-year-old phenomenon. But those are just signs of the adjustments everyone's making to social media and the roles it creates for us. Consistency is key, and integrity is better. I've counseled many clients that if they want to call their blogs, "Daily X," it had darn well better be daily--you'd think that'd be obvious, but no. Consistency in posting is the best mantra, even if you post only once a week. Even better is integrity: Don't violate your own policies, do announce changes rather than let people wonder, answer all questions, post all the comments except the ones that violate your stated policy (you do have one, right), and do the right thing. Real works better. Have some opinion. Share perspective. Get specific. Don't push yourself to write about something you don't care or know about. Do give the readers some clues to who you really are. To be honest, this took me some time in blogging, but came to me more naturally on Twitter, and now I'm consistent in both mediums. So if you follow me, you will hear about my effort to learn guitar, my travels and occasionally what I'm cooking for dinner, in addition to what I'm sharing about social media and communications and my work doings. As a result, I have forged stronger bonds with clients and made a boatload of new friends. Ask why. I am fortunate that people often introduce themselves to me saying, "I just love your blog." And I always say, "Thank you so much--and tell me why." If you miss the opportunity to seek feedback from readers in any form--in person, in the comments, in the other forums where your feed appears--you're missing an essential way to understand your blog and your readers. Readers rock (see number 3), so rock with them. Ask and find out. Thanks for reading this list and the blog. Please start leaving me another five years' worth of ideas, questions and comments!